Concern about imminent inflation is at the heart of criticism of the Fed's quantitative easing programs. Charts 1 and 2 depict recent trends of much tracked price gauges and the main take away from these charts is that inflation excluding food and energy are contained and higher energy prices have translated into only a less than proportionate increase in core prices. The most followed inflation measure, the Consumer Price Index (CPI), has risen 3.2% from a year ago, while the core CPI, which excludes food and energy, has moved up only 1.3% (see Chart 1). 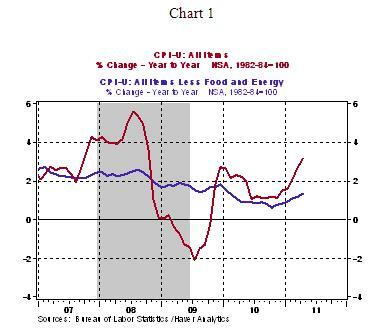 The divergence between these two measures implies that inflation is not widespread. The Fed's preferred measures of inflation are the personal consumption expenditure price index and the core personal consumption expenditure price index (see Chart 2). Both these price gauges send a message close to that of the CPI. 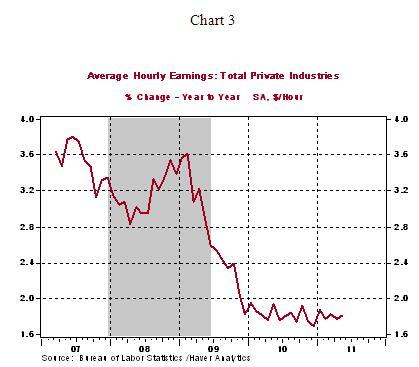 Hourly earnings, an indicator of wage pressures, are also indicative of benign wage inflation (see Chart 3). 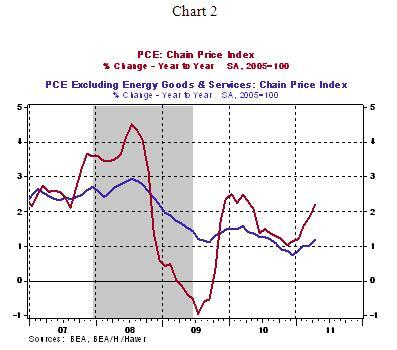 Based on these charts, the FOMC's view that higher food and energy prices are transitory, which Chairman Bernanke reiterated in the June 7 speech, stands justified. Projections of slowing economic conditions suggest that inflation in unlikely to haunt financial markets until demand conditions gather steam.